The Big Takeaway: Only real news was Roman Reigns successfully defending the Intercontinental Championship in a great match against Roman Reigns. Asuka defeated Alexa Bliss in a nontitle match to set up Asuka getting a title shot, presumably soon. At the top of the show, they announced Alexa Bliss would face Asuka in a nontitle match tonight. Bliss was made over this and hunted down Angle backstage demanding that he reconsider this match. Angle said he wanted to start 2018 with a WrestleMania caliber match. Bliss said that Asuka attacker her last week, unprovoked, and said Asuka is already in the women's Royal Rumble. If Asuka wins the Rumble, then she will face Bliss at WrestleMania, which Bliss said should be enough. Angle said if Bliss was upset with Asuka, she can take them out on Asuka later tonight and it's not like this is a title match...yet. Angle's music began playing so Angle went to the ring. Angle announced the women's Royal Rumble would be 30 women and, just like the men, it would be over-the-top rope elimination rules. Sheamus and Cesaro came out upset over Seth Rollins and Jason Jordan getting a title shot at the Raw Tag Team Championships last week even though they had never teamed together. Cesaro said what Angle did after Rollins and Jordan won last week was too much. They showed footage of Angle hugging Jordan after winning his first championship. Sheamus accused Angle of favortism because his son didn't deserve a chance at the tag team championships. Cesaro said they wanted a rematch tonight. Angle said they would get the rematch when he says so. Jordan walked out to boos. Jordan said if he didn't deserve an opportunity at the tag team titles, then why was he wearing this (tag team belt). Jordan said if Cesaro kept running his refurbished mouth, he would get another trip to the dentist. Jordan and Cesaro got ready for a tag team match and Rollins came out. Rollins told Jordan that Jordan accepted a match against Cesaro with Sheamus in Cesaro's corner, so he was outnumbered. Rollins said Jordan was self-absorbed, which forced him to protect his half of the tag team titles. Crowd started chanting "Daddy's boy" at Jordan. Rollins said he was only there to watch Jordan lose. Jordan won with a hoist neckbreaker. Cesaro worked over Jordan's left knee the entire match and put on a half crab. Jordan made the ropes. Sheamus was set to interfere and punch Jordan, but Rollins jumped Sheamus. This distracted Cesaro, leading to the finish. Match was mainly Cesaro using submission holds. Booker T talked about how wrong it was that a tag team in their first match won the tag team titles and claimed it was the first time it had ever happened in wrestling history. How many times has it been done to build up a WrestleMania program in the last 20 years? Reigns did an interview with Renee Young. He said Joe had jumped him, beaten him and bullied him. He said tonight he will stay within the rules to fight Joe---probably. Sasha Banks did a promo saying the first women's Royal Rumble would be Boss time. Bray Wyatt won with Sister Abigail. Titus O'Neil and Dana Brooke joined Apollo Crews at ringside. Just before the finish, Brooke jumped on the apron as Wyatt teased the finish. Wyatt gave her an evil stare, which scared Brooke enough she practically fainted and crashed into O'Neil at ringside. Crews hit an enzuigiri and teased the twisting power bomb, but Wyatt hit his finish. Postmatch, Matt Hardy did a promo saying last week he turned Wyatt's fireflies into his Woken Warriors. Hardy said he would diminish the powers of Sister Abigail and delete her forever. Bliss found Nia Jax backstage. Bliss wanted Jax to join her at ringside for her match with Asuka. Jax said she had to leav because Enzo was sick in the hospital with the flu. She said Enzo wouldn't be able to defend the cruiserweight championship tonight. Bliss couldn't believe that Jax would choose Enzo over her and told Jax it was either Enzo or her. Jax said her chicken soup is getting cold and walked out the door. Bliss wondered if everyone has lost their minds. Asuka won with a roundhouse kick followed by the cross armbreaker for the tapout. Match didn't have much heat. Bliss stalled a lot early because she acted like she didn't want any part of Asuka. Bliiss got the heat with several submission holds, including a guillotine. Asuka made her comeback after Bliss slapped her. Michael Cole teased Asuka getting a title shot next at Bliss. Young, looking apprehensive about talking to Joe subtly acknowledging that she's married to Dean Ambrose, interviewed Joe. Joe did a strong promo saying because of him, he's made Ambrose a stay at-home dad living off his wife's paycheck. They flashed to Young when he said that and she wasn't happy. Joe said by the end of tonight, he would show Reigns that it may be Reigns' yard, but he's living in Joe's world. Bayley did a promo about how she was going to win the Royal Rumble. This might as well have been 911 in the ECW Arena in 1995. Heath Slater started leading chants for Rhyno, and a sizeable amount of fans followed along. Braun Strowman dares Slater to get in the ring, so he basically became a handicap match. Strowman defeated Rhyno with a running powerslam. Then he gave Slater a powerslam. Fans chanted "one more time." So Strowman gave Rhyno another power slam. Then Slater another one. Then he delievered one each to both men again, following with the fans' wishes. Backstage, Rollins approached Reigns. Rollins said he didn't want Reigns to lose the Intercontinental Championship tonight just because Joe make Reigns lose his cool. Reigns said no one does what Joe did to their brother, Ambrose. Then Jordan walked in like a total geek and said if anyone tried to interfere against Reigns tonight, on behalf of he and his tag team partner Rollins, they would put a stop to it. Jordan left and Ambrose and Reigns had the weirdest look on their faces. Strowman bumped into Kane backstage. Kane said he just wanted to talk to Strowman about Lesnar. Kane said they were the alpha monsters (note that term) of the WWE and together they can tame the beast. All it takes is being on the same page. Strowman said he didn't care about Kane or his plan, when he takes down Lesnar he's going to do it on his own terms. Kane just snickered and walked away. Angle was on his cell phone when Finn Balor approached him. Balor said he was the first Universal Champion and he was never granted a rematch. Balor said he officially has entered the Royal Rumble. Angle said he thought Balor came to talk to him about something else. Balor revealed that he had arranged a match between the Miztourage and Elias vs. Balor and two partners of his choosing. Balor revealed his partners as Karl Anderson and Luke Gallows. Balor said he had faced these men as his opponents before and had competed against them before, and it's better to have them on his side. A high bar has already been set for the best Raw match of 2018 because this was excellent. There's an intensity that Joe brings which makes his matches feel like they're on another level than any other heel on the roster. Reigns won after a spear. Joe got the Coquina Clutch, but Reigns got an arm drag to escape, leading to the spear. Earlier, Reigns hit the drive-by outside the ring, then picked up the ring steps. Joe dared Reigns to use them, knowing he would get disqualified and it would cost Reigns the championship. Instead, Reigns put the steps down. Joe cheap shotted Reigns, but Regins hit the Superman punch. Reigns hit another Superman punch, but Joe kicked out at two. Joe went for an uranage, but Reigns got Joe's back, leading to Joe pushing Reigns into the referee. For a moment, the referee teased he was going to disqualify Reigns, but ruled it wasn't intentional. Joe hit a uranage for a long two. The fans were going crazy by this point. This match went two commercial breaks and included Joe getting the elbow suicidia and an stiff elbow smach where Regins' head bounced off the canvas. Great work by both men. Postmatch, Angle watched Reigns' celebration when Paul Heyman walked in. Heyman told Angle he knew there was a conspiracy by Strowman and Kane to gang up on Lesnar. If that conspiracy costs Lesnar the Universal Championship, Lesnar will be proactive and not reactive in his vegenace because 2018 will be known as the Year of the Beast. Paige, Sonay DeVille and Mandy Rose did a promo saying no one has made an impact in the women's evolution in WWE like they have and one of them was going to win the Royal Rumble. Drew Gulak and Ariya Daivari were in the ring. Gulak again announced that Enzo was out with the flu and read a note supposedly written by Amore from the hospital, complete with his opening catchphrase. Cedric Alexander came out and said since Enzo didn't show up, he still wanted to face competition tonight and challenged either Daivari or Gulak. Daivari said they would only compete against Alexander in a tag team match and challenged him to find a partner. Of all people, Goldust came out. Goldust told Daiviar and Gulak he has friends in low places, but no one as low as those two. Alexander pinned Gulak after the Lumbar Check. Goldust and Gulak blew a bulldog spot bad. Fans chanted "you still got it" at Goldust after he hit a twisting crossbody on both heels. Elias was in the ring for another performance. He said after his match with John Cena last week, WWE stands for "Walk With Elias." He was joined by Curtis Axel (on jingle bells) and Bo Dallas (with a golden cowbell) for a performance of "Auld Lang Syne." Dallas mentioned that the Miz would return next week. Axel and Dallas were totally off key in their singing and Elias ordered them to tone it down. Balor pinned Dallas after Gallows and Anderson gave Dallas the Magic Killer and Balor finished him off with the Coup de Grace. Gallows and Anderson wrestled as total babyfaces, so maybe they've done one of those turns without turning. Lesnar and Heyman came out for the main event segment to 'Suplex City" chants. 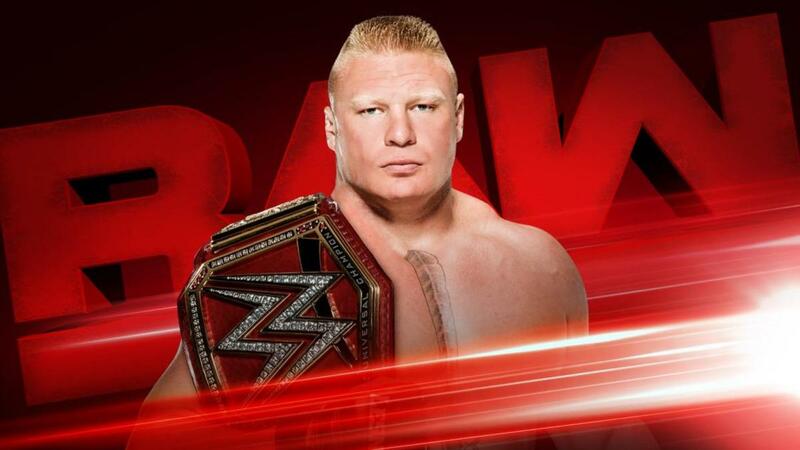 Heyman said it would appear to him that the WWE's New Year Resolution is to continue to stack the deck against Lesnar. Heyman said what other way is there to explain Lesnar defending against more than one man. Heyman said it used to be a champion defending his championship against a challenger. But at the Royal Rumble, it would be the beast defending against the Monster and the Machine. Heyman brought up the possibility that if Kane and Strowman beat the other, they win the Universal Championship. Heyman said Lesnar will successfully defend the Universal Championship at the Royal Rumble. Heyman said it doesn't matter how you stack the deck against Lesnar, you can line up all 30 wrestlers in the Royal Rumble and Lesnar would eat through every one of them as well. Heyman said Lesnar fears no challenge, he fears no challenger, he fears no challengers, he doesn't believe in monster and he doesn't believe in devil. Heyman said he's had a one-on-one with the man down below, and his favorite is Lesnar. Lesnar and Heyman started to leave when Kane came down. Kane grabbed Lesnar by the throat and choke slammed Lesnar. But after selling it for a moment, Lesnar sat up just like Kane and started laughing. Lesnar clotheslined Kane over the top rope. Then Axel, Goldust, O'Neil, Crews, Anderson, Gallows and a host of others pulled Kane to the back.